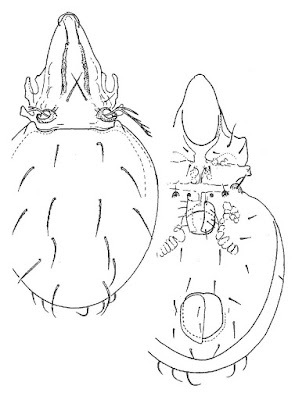 Dorsal (left) and ventral views of Ctenobelba perezinigoi, from Norton & Behan-Pelletier (2009). 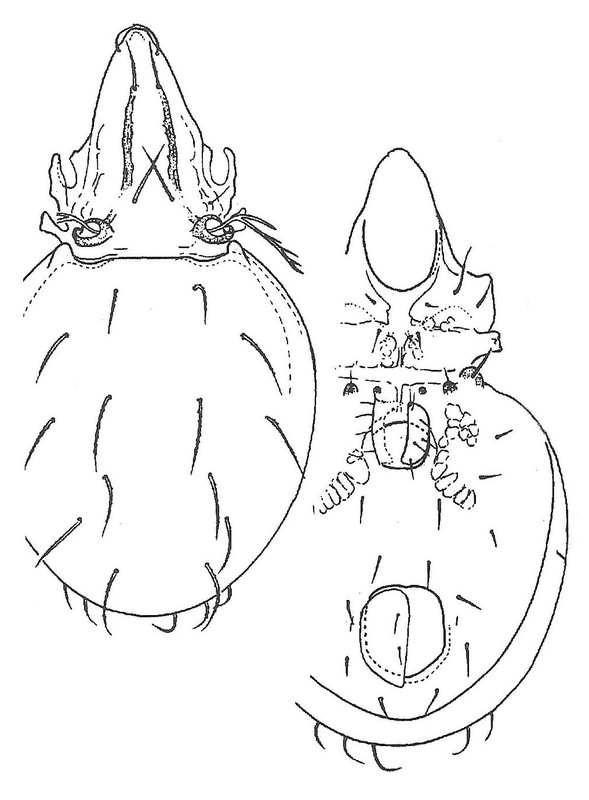 Ctenobelba is a Palaearctic genus of oribatid mites with tactile first legs. Characters (from Norton & Behan-Pelletier 2009): Length 400–500 µm. Gnathosoma normal; chelicerae with dentate chelae, two setae; rutella normally developed. Prodorsum without true lamellae, with parallel costulae; shorter in length than notogaster. Notogaster without scalps; with ten pairs of setae, one seta anterior to lyrifissure ia; octotaxic system absent; dorsophragmata and pleurophragmata absent; paired opisthonotal glands opening directly on notogaster. Pedotectum II present. Proral setae of tarsi spiniform. [G46] Grandjean, F. 1946. Les poils et les organes sensitifs portés par les pattes et le palpe chez les oribates. Bulletin de la Société Zoologique de France 71: 10–29.